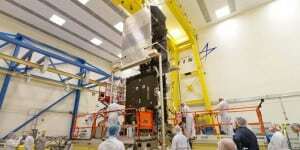 [Via Satellite 09-19-2014] Lockheed Martin has successfully mated the large system and propulsion modules of NOAA’s first Geostationary Operational Environmental Satellite-R series (GOES-R) next-gen weather satellite. Now, with the core spacecraft assembled, the company will install the six weather and solar monitoring instruments. The GOES-R satellite is scheduled to launch in early 2016, and will provide real-time weather forecasts and early warning products to public and private users. Engineers will begin the functional and environmental testing phases of the program this fall. Lockheed Martin is building the satellite on the A2100 bus. The spacecraft’s system module contains command and data handling, communication, and electrical power subsystems. These components are stored in more than 70 electronic boxes. The propulsion core, which functions as the structural backbone of the satellite, carries the integrated propulsion system for use in orbit raising and station keeping.